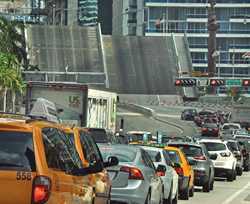 Given the endless increase in traffic congestion and Miami’s limited mass transportation options in downtown Miami, one City Commissioner has gotten approval to pursue a study for a tunnel under the Miami River to replace the Brickell Avenue draw bridge. Commissioner Francis Suarez recognizes that the problem will only get worse with the opening of the many buildings under construction in the area. This isn’t the first time that tunnels under the Miami River were being considered. Fifty years ago, in 1965, there was consideration to create multiple tunnels to replace the Brickell Avenue and 5th Street draw bridges. At the time, City Commissioner Sidney Aronovitz led the charge to get community support for the replacement of the bridges. There was even some discussion to have interstate I-95 traffic travel under the Miami River rather than high above it. However, the interstate project was too far along to change course. Even prior to the 1965 discussion, there was a story in the March 7th, 1955 Miami Daily News, entitled “Tunnel Election Good Beginning”, calling for property and business owners in downtown Miami to support the replacement of the draw bridges with tunnels. The article justified the consideration for tunnels as “travel to and from the area is being hampered by frequent openings of the Flagler Street Bridge”. Although sixty years later, the complaint is still relevant today and can be applied to all bridges connecting the north and south sides of the Miami River.